Office Tab ($25, 30-day free trial) solves one of Microsoft Office's shortcomings: How to handle multiple documents open in different windows. Unlike Web browsers, Office doesn't use tabs, so you can't see at a glance all the documents you're working on, and it's not easy to switch between them. 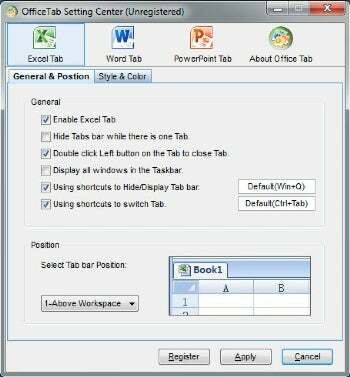 Office Tab solves the problem by putting tabs on Office, Excel, and PowerPoint. Office Tab adds tabs to Office documents, and lets you easily customize where those tabs show appear and how they work.